We have a definite soft spot here at Elliot’s House for breeds that are tough on toys; bulldogs, terriers and pit bulls just like our very own Elliot know how to annihilate even the most durable playthings! We all love to spoil our pups, but there are a few important factors to look for when deciding on the right toy to reward your best friend with. As fun as stuffed animals and squeaky toys can be, tough chewers (and all dogs for that matter) have an instinct to rip the stuffing out of the toy and remove the squeaker. Obviously these objects can pose a choking risk if swallowed, so it’s best to choose toys that remain intact no matter what they’re put through. Overall you want to look for reputable, US made products with no extra parts that may be ripped or chewed off. Now that you know what to avoid, let’s get into some of the most popular and long-lasting tough chew toys on the market today! 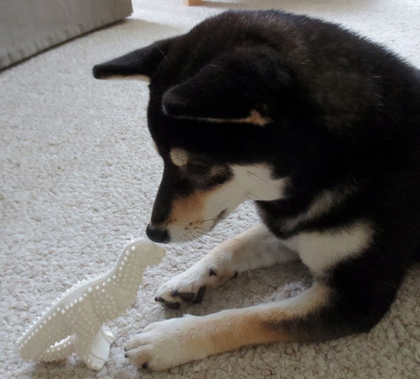 The T-Rex by Nylabone comes highly recommended from pup parents of the toughest chewers due to its extreme durability, fun shape and effectiveness as a dental chew. The small rounded nubs and bristles aid in preventing plaque and tartar build up while your pup chomps away! As with all toys, you should always supervise and replace when the toy begins to break down (which takes a while with this toy)! If you dog generally destroys any toy you put in their path, products made of tough natural rubber are your best bet. What makes the Tuffy boomerang an option as a fabric toy is the bulked-up construction and multiple reinforced sewn layers. Each of the seven layers of fabric are sewn together in additional to a protective webbing around the stitching, making this toy the one of the longest lasting fabric options on the market. When you factor in it being both floatable and machine washable, this boomerang is a home run! West Paw is an owner-favorite out of Montana that backs all of their toys with a 100% replacement guarantee for tough chewers. If your dog manages to destroy it, they’ll replace it no questions asked! 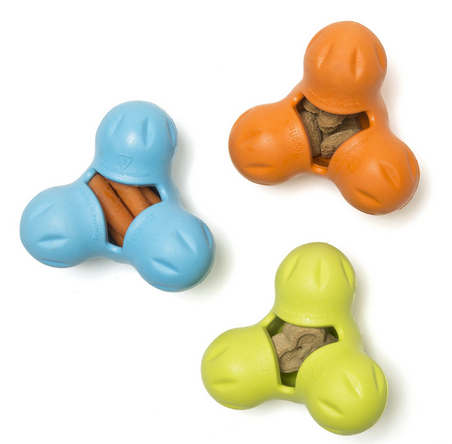 This particular toy floats, bounces, and can be stuffed with either treats or ice cream/peanut butter and frozen to keep your pup occupied for hours! The Tux is a great example of the quality products produced by West Paw, and the reviews speak for themselves. As classic as tennis balls are as a ‘dog toy’, anyone who has ever tossed one to a tough chewer knows how quickly they become a shredded mess. This is not only an inconvenience but a huge health hazard as the ball breaks down into a hundred pieces of fuzz and rubber that can easily become ingested. 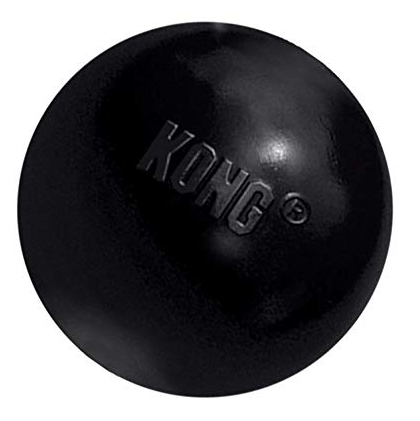 Enter the Kong Extreme Rubber Ball! Kong is a trusted and celebrated company for a reason, as they produce beyond durable products beloved by tough chewer owners. This particular ball will out bounce a tennis ball any day and is highly puncture resistant for rough catch sessions! Another innovative and highly recommended product from West Paw, the Bumi Tug-of-War is a bomb-proof new take on your typical knotted tug rope. While a normal rope can become split and picks up dirt and bacteria easily, the Bumi is dishwasher safe, maintains its structure and stretches to twice its length during play! Also backed by the same guarantee against dog damage as the Tux, this toy will outlast the competition and tire you and your pup out in the process! As with any object you introduce to your pup, do your research and be sure you purchase the correct size for your dog’s weight and size. While these toys are definitely built to take a serious beating, no toy is completely indestructible so it’s best to supervise and interact when using a toy at all times. Now that your walks may be getting shorter due to the weather, take some extra time to reward your best friend with a quality new toy and some indoor playtime! Get out there and have a ball!